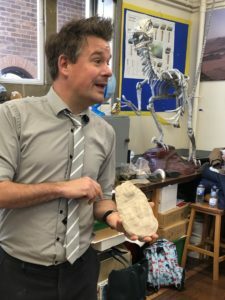 Mike Mawby, our Head of Earth and Planetary Sciences, recently ran two fossil workshops for sixty year 3 pupils from Wincheap Foundation Primary School. The pupils walked over from Wincheap to the King’s School and Mr Mawby’s lab. They met some of the resident dinosaurs and had a chance to look at and handle amazing fossils including a 25 million year old turtle poo which still had the fish scales in it from the turtle’s last meal! 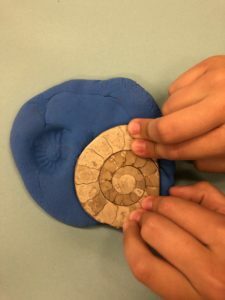 The children also made their own casts of fossils by pressing fossils into a play-doh and filling it with plaster. Once these were dried they were delivered to the pupil’s school so that they could be decorated and taken home. The visit was rounded off with a fun quiz which allowed the children to show off their fantastic knowledge of dinosaurs and anatomy, followed by a fossil lucky dip. The pupils were buzzing with excitement when they left having learnt all about the fun of being a palaeontologist, an excitement which far outlasted their walk back to school. One boy told us as he left, “when I’m older I’m going to get a passport and go to Africa and look for fossils too”.